The Commissioner of Entrance Examinations has published the trial allotment for admission to the Engineering/Medical/Architecture courses, Kerala for the academic year 2014-15. 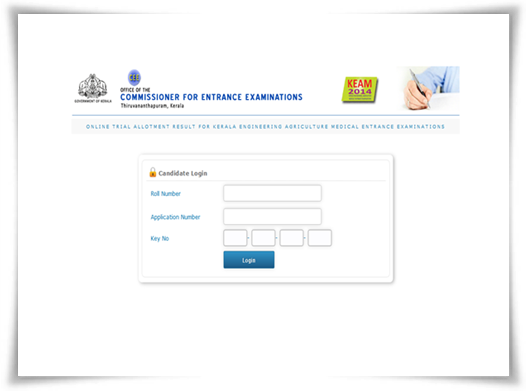 Students who got their names included in 2014 Kerala Medical (Except MBBS/BDS)/Engineering/Architecture Entrance Examination rank lists, can check the trial allotment from 21st June from the CEE website. The trial allotment stands as a gateway for students who are eagerly waiting to know their admission status. More than getting well acquainted with the admission process, a student can also know the course and college, he/she would be admitted. The trial allotment is being published based on the options registered by the candidates before a specific time. As this allotment is made only for general reference, students need not to pay the fee or take admission in the colleges based on it. The general last rank for each category, course and college is published along with the trial allotment. Those students who couldn't register some options can make the necessary changes in their option registration before the stipulated time. The KEAM allotment schedule 2014 will help the students and parents to know the important dates concerning the admission procedure. The schedule for further allotments will be informed in due course through a notification. It is recommended to download the KEAM 2014 notification from the CEE website to get a clear picture about the various colleges and also the fee structure of various courses. Students can modify and rearrange their options based on the trial allotment and should be finalized before 5 PM on 23rd June 2014. The 'Option Facilitation Centres' (OFC) and 'Help Desks' (HD) with internet facility are well set in different parts of the state facilitating students to complete the registration process. 19 Help Desks (HD) are arranged in various districts of Kerala. 2 help desk each are set in Thiruvanathapuram and Ernakualam to complement the filing options. Meanwhile 32 facilitation centres with facility for Password reset and obtaining key numbers for option submission functioning in the state have proved to be a blessing for the students. After the time assigned for making modification in the options, the first allotment will take place on 25th June. To check the KEAM Allotment status 2014 online, do visit the following links.